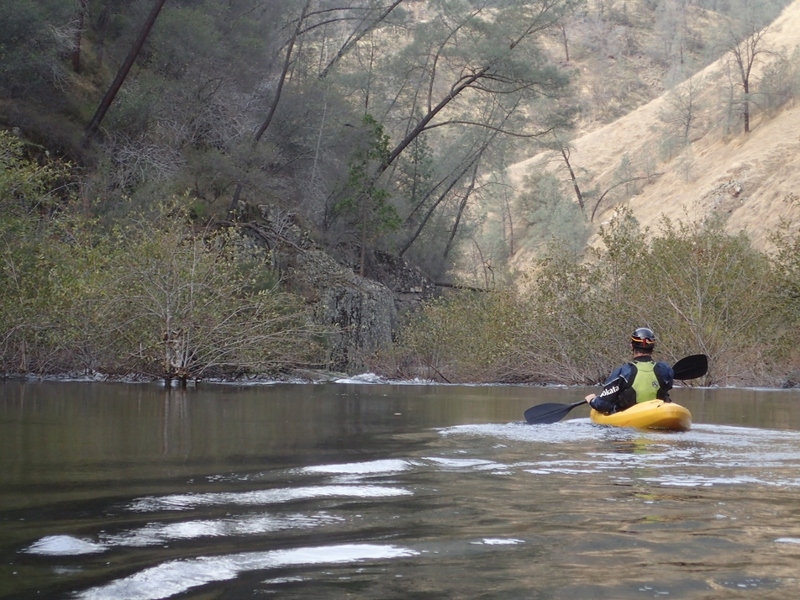 Continued from the Squaw Leap Write-up: The next day we woke up planning to do Patterson Bend. The run is known for having a particularly hard rapid that also has a very hard portage… very hard. What surprised us was how scenic it was. From the campground where we camped near take-out, as we drove up river for shuttle we were surprised to see just how deep of a crack the canyon is in as it goes through the crux section which contains Binocular. As soon as you climb and bend right, you get a brief glimpse of the river, this is where you can see binocular from… however it is a mile or two away so do not plan on getting any significant information from it… even with binoculars. Once on the water, you have to paddle across the lake. 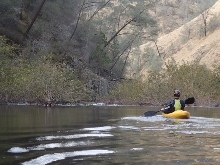 For us this was greatly aided by lower water levels allow for there to be current for the first mile and change of it. 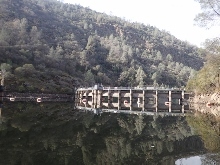 At the dam, we quickly portaged around on the left. 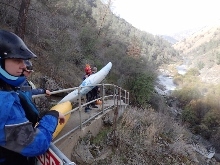 Distracted by the helicopter that the crews had to use, we apparently did not even notice that some point between climbing out of the lake and putting in below they raised the flow by 3 gates. This would come back to haunt us a bit downstream. 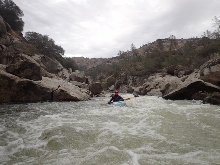 Putting on the river starts with some fun class III to III+ rapids. 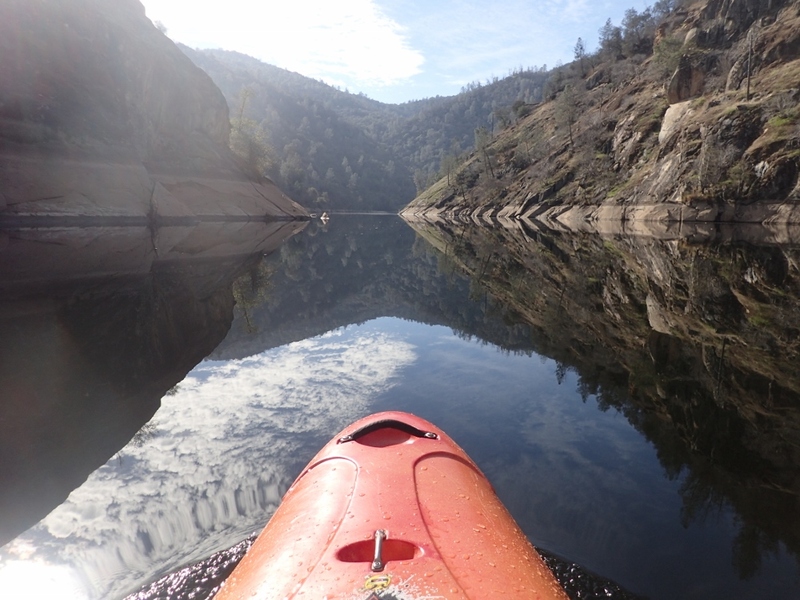 This then turns to long periods of flat water with an occasional rapid. 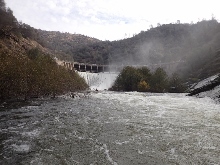 I think at this point we were still on the 3,000 cfs rather than the 2,000 cfs that was just ahead of us. A few spicier rapids in the class III+ to IV range then opened up to mostly flat water with just an occasional rapid. 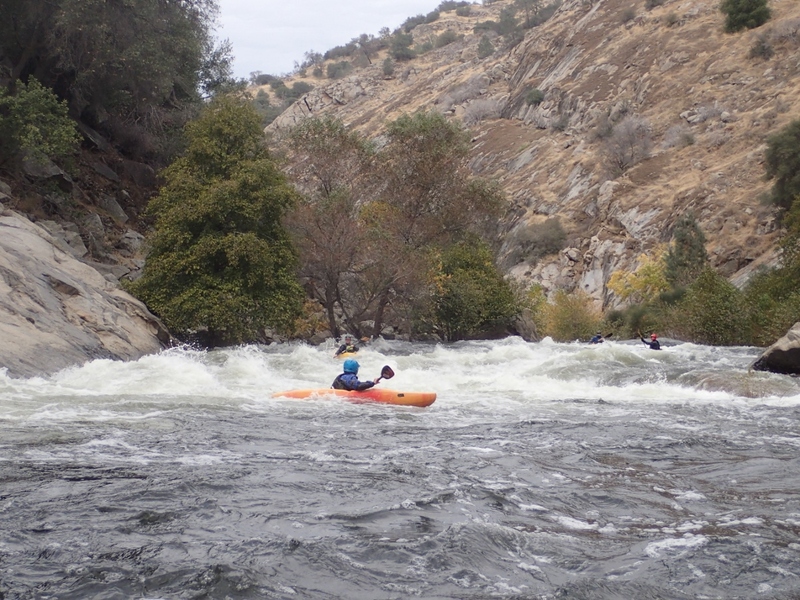 Though those occasional rapids felt class IV due to the size of the hydraulics we were avoiding. 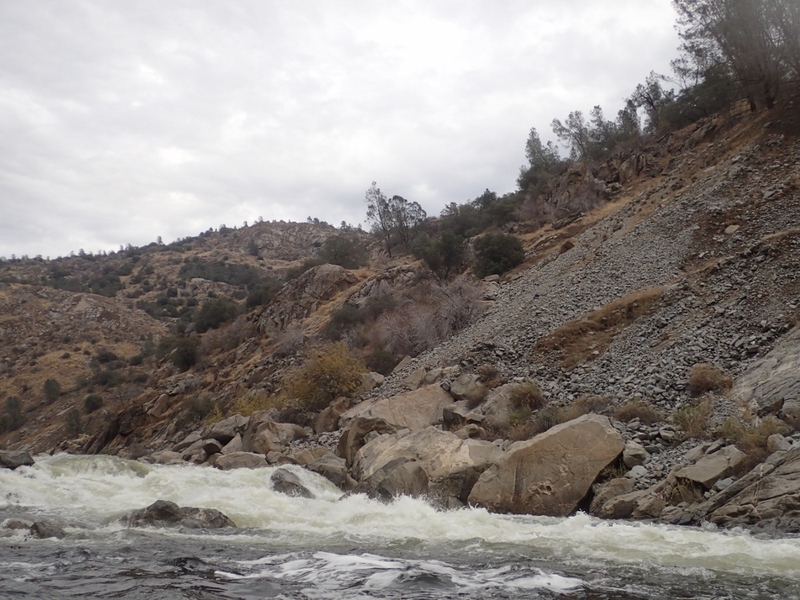 All would have felt perfectly in place on the Lower Tuolumne. /the river makes a huge bend turning North West, South, then East… as it then bends back down to the South you finally reach the crux section. 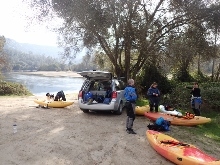 I hope you aren’t tired from the flat water paddling as you will need your energy! American Whitewater has the “First Five” rapid listed as class V… I think that must be at certain flows as we all dropped into it without even boat scouting and it went fine. 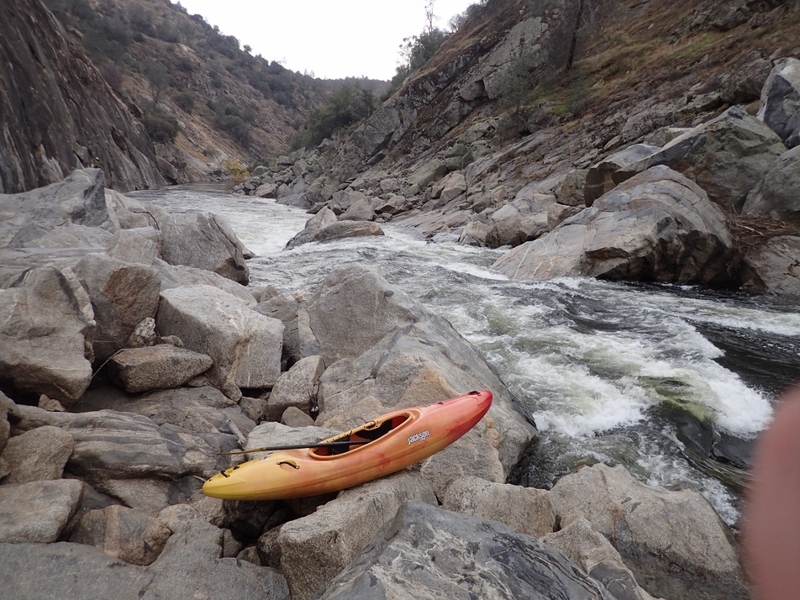 I would have called it an easier IV, easier than many of the rapids upstream even. 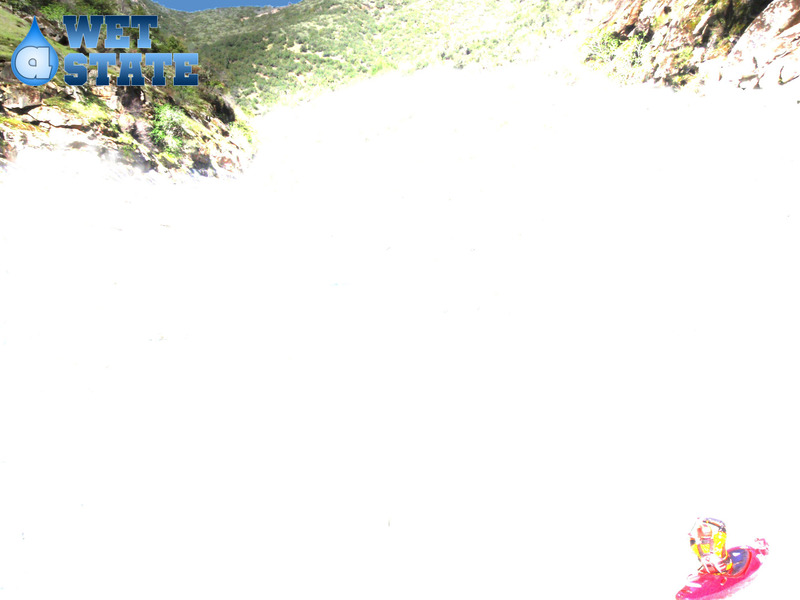 Below though you arrive at El Limbo which is a solid rapid that is hard to scout. Darin got out on the middle sieve pile while I scouted from the right shore. We all then ran through. Downstream a few fun class III to IV await before you find yourself above the obvious Binocular. I tried to scout from the right but I would have had to climb dangerous loose cliff slope to see anything as an overhanging wall prevented my view. I ferried over to the left to join the group to see the top two features. Looking downstream we couldn’t see the exit feature without more effort, Haven and Shannamar had taken a look and said it wasn’t bad… Jeff and I were motivated to run it which was interesting because Darin wasn’t super enthused. That certainly doesn’t happen often! 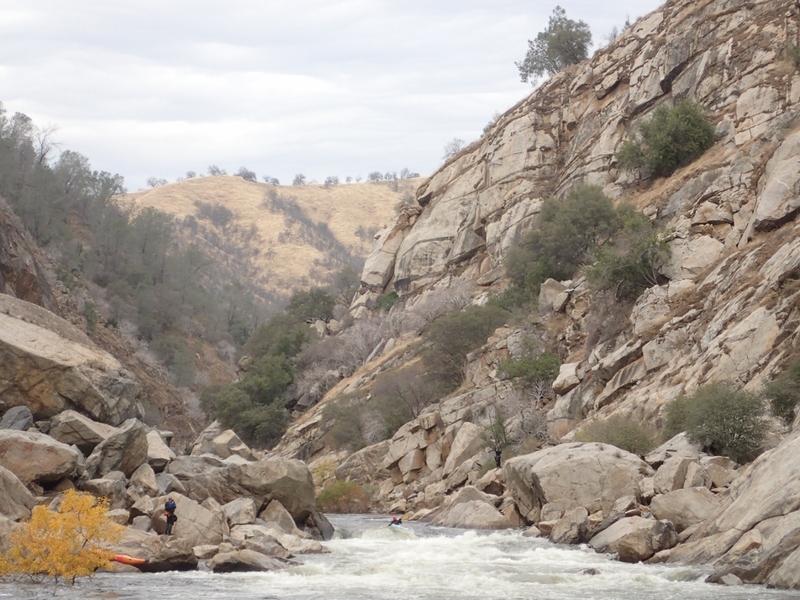 Once Jeff and I were below, I tried to get out on a mid-river rock and lost my paddle as I climbed out. 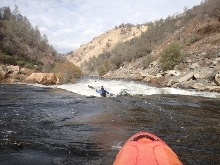 As that was my breakdown (didn’t bring a full paddle on my business trip) I jumped in and hand paddled after it catching before the next rapid. I then go back up and choose a different rock to climb out on and then pull Jeff onto the same rock. As we wait for the rest to come through, Darin goes first and paddles over and asks “Is Jeff not worried about his boat?” We look down in horror to see his boat no longer on our rock and floating towards the next rapid. Darin chases and we can’t tell if he gets it. Jeff jumps in and swims to shore. 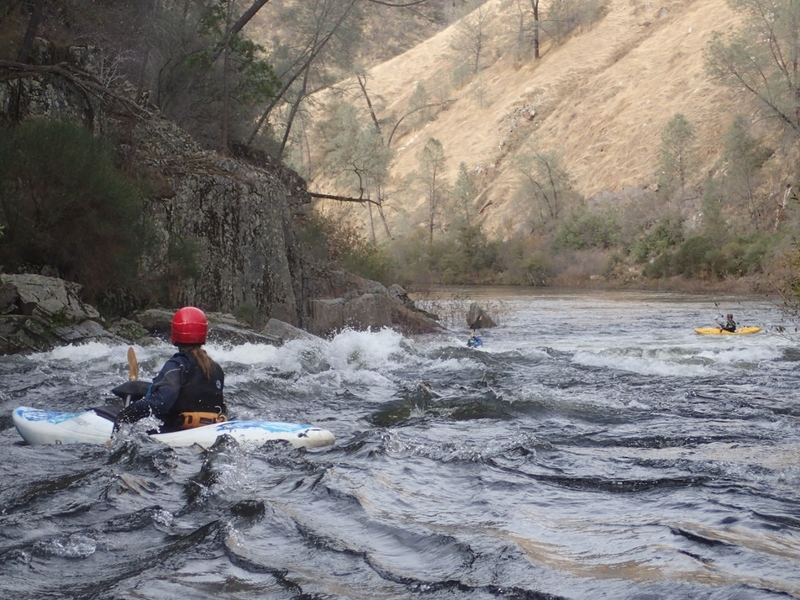 Shannamar and Haven run down the rapid. 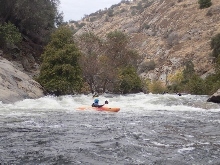 They then continue down and scout the next rapid. I put my camera away and get signals for the next rapid which I then drop into… and see to my great surprise that Jeff’s boat is pinned in a sieve against the wall. The group then regathers and inspects and decides that live baiting above a sieve isn’t safe enough to warrant and decide to Leave Jeff’s boat there to retrieve later. Jeff then climbs up the steep left slope to the trail on the rim above… it is only 200-300 feet but it looked strenuous. The rest of us then continue down. 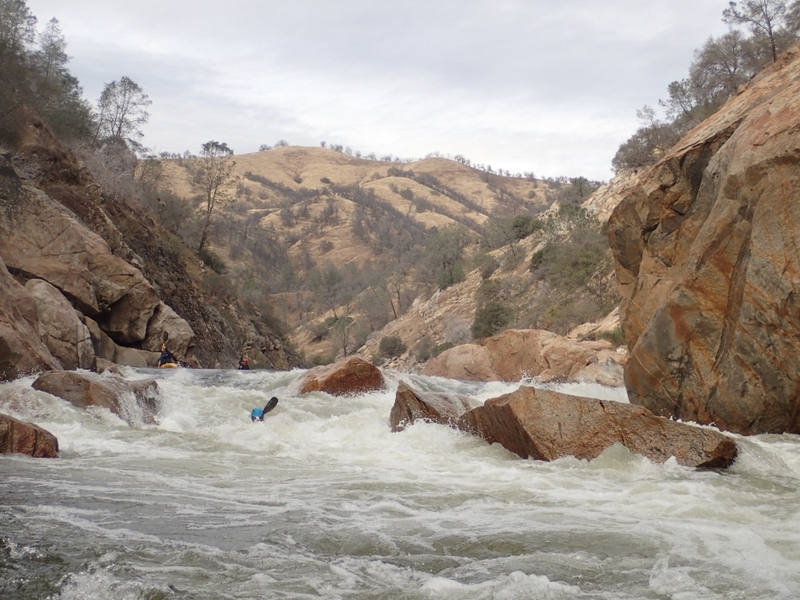 After 3 or 4 boogie rapids we find ourselves at the Squaw Leap put-in… that is good, Jeff won’t have to hike far! We opt to take a quick lunch break as it was now almost 2 o’clock and haven’t eaten yet. 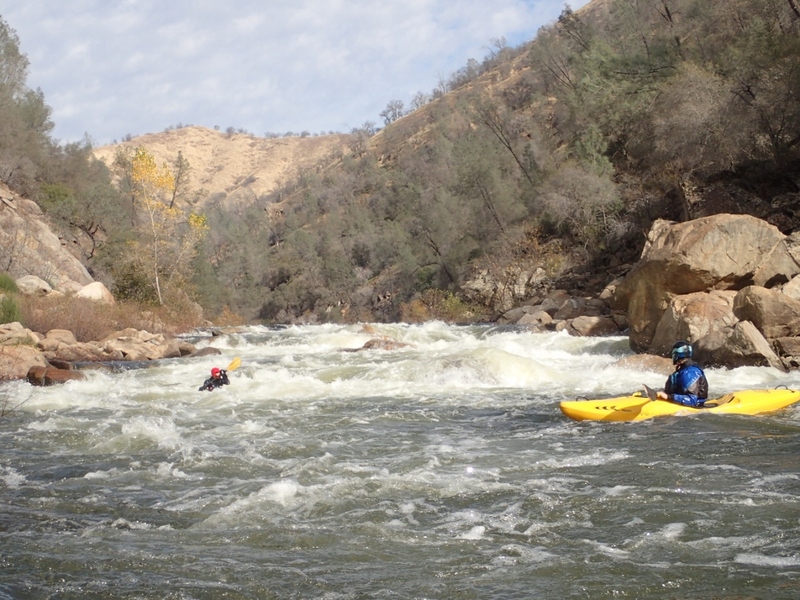 There was some discussion that the one or two rapids we ran were beefier than the prior day and that water must have risen. I honestly wasn’t certain… I thought maybe it was a little bit up but not a whole lot. While sliding back in his boat Darin states he thinks it has just come up a foot since we got out, I paid it no mind. 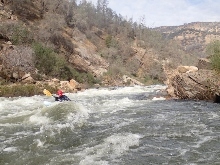 Downstream we get to a rapid that was a boof with a ledge the prior day, today it was a ramp with a soft hole… no ledge. 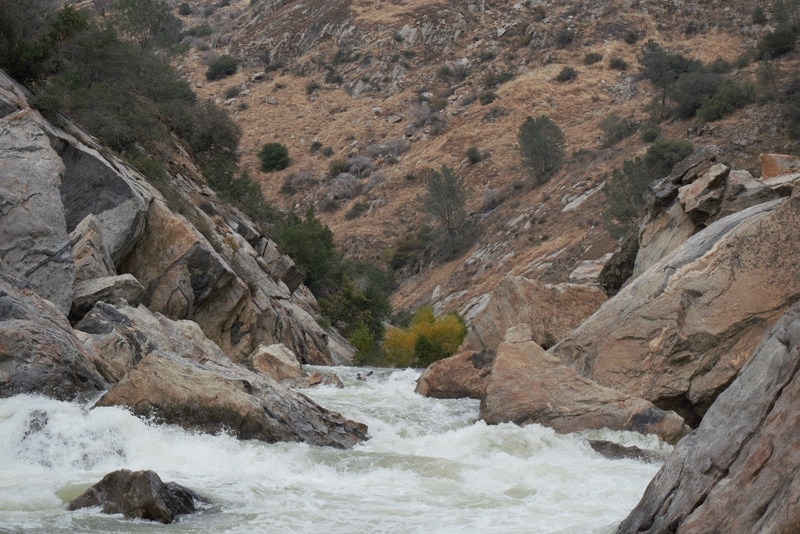 This opened my eyes but still, we didn’t think it would change what was downstream much. So with that optimism in mind I paddled up to the lip and committed to Squaw Leap #1 before seeing what the increased flow had done. As I do, dread settles in, I yell over my shoulder to them to scout… they all wear ear plugs and none of them heard me… so they didn’t know what was a shallow slide into a relatively calm eddy was now a full water boof into a recirculating and depressed pocket. I manage to get a good boof but carry too much right momentum and end up in a hole exiting the pocket, flipped I roll up onto then get flipped face first into the right wall where I am not in a recessed pocket. The prior day I ran the line near there, so I pushed off the rock into the outflow that I hoped wouldn’t get me stuck in the hole nearby. Luckily it worked and I rolled up in time to see Darin have a sweet line through the bottom. Then Haven came through with a nice line through the top only to get stuck in the bottom hole in the middle, she battled and somehow made it out still in her boat… I think I would have swum! Next Shannamar came through and didn’t get a good enough boof through the top, landing in the pocket and getting firmly stuck. Quickly I saw some ends getting through and a battle ensuing. It is actually one of the more worrisome situations I have seen. I could tell it had potential to hold her, I quickly exit the river. I am on the wrong side of the river but I am hoping I can work up to parallel to it and hit the 70 foot throw. I knew that ferrying over to the other side may not work as it was a very hard ferry to make and that even once over there climbing up the house sized boulders would take at least 5 minutes, all of that would be too late so best bet was to work up the size I was on. Close to a minute later I saw her still recirculating, now out of her boat. 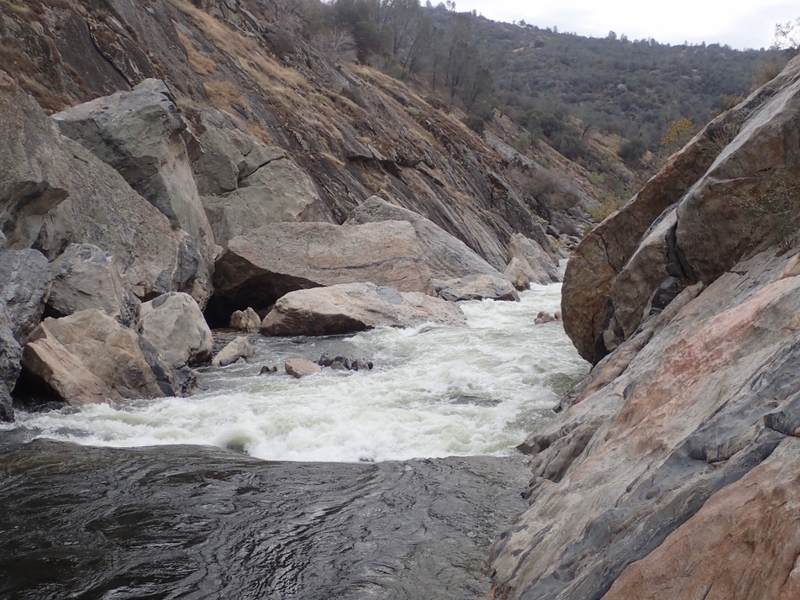 I jump a few more rocks… then to my great relief I see her float out, exhausted but alright. Darin and Haven managed to get her boat and paddle to shore at the lip of #2. The boat was pushed out of the main current and it pinned itself in the small side channel. Easy to access we quickly pull it out. Everyone is shaken up and pretty much over it as now we realize the flow is so high. We portage the entry move of #2 and seal launch in backwards below to then immediately ferry across to the left channel for the exit which we are all relieved to see is washed out compared to the lower flow. Downstream we make quick progress to take-out where we are grateful that the mini-epic didn’t go any worse. We hike out to find Jeff sitting in a chair drinking a beer, having beaten us by a good bit. We share the news with him that the water rose and that almost certainly that is why his boat floated away. In total, this run is interesting. I enjoyed it. The canyon walls were classic California granite, something I haven’t gotten in a few years while living out east. 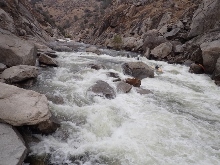 The rapids were powerful and held deep retentive holes within their paths. And the miles were plentiful, something that is also hard to come by out east. The major downside is the fact that portaging is nearly impossible. Apparently you can climb up onto the walls above Binocular to portage, but that looked heinous and seemed like WAY more work than the run was worth. 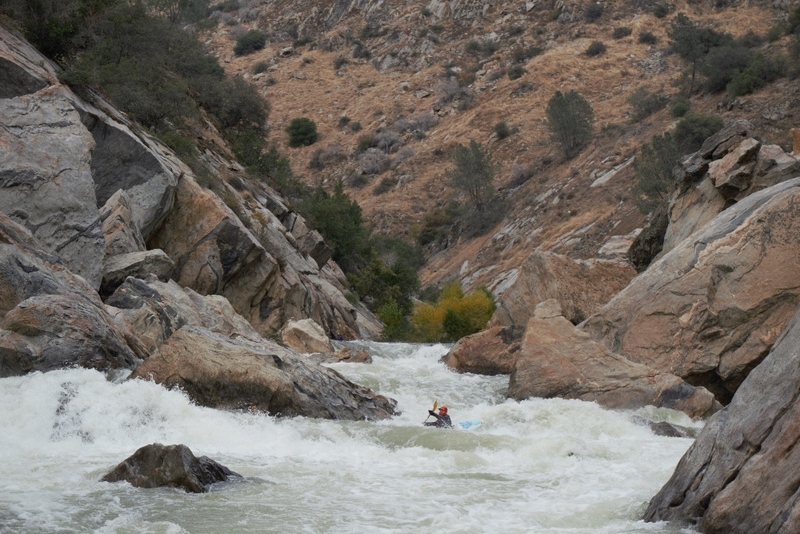 I would say if you want a portage to be on the table… don’t bother going into this run. 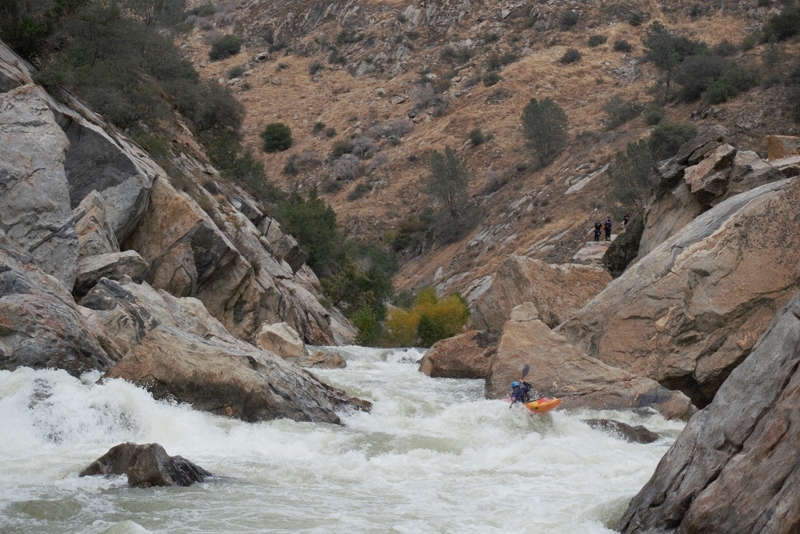 Now that brings to the other challenge… the fluctuating flow can make you want to portage! I think at lower flows you would be able to run the lead in hole and then eddy out on the right before the crux middle. Jeff accidently eddied out there even at the higher flow, but I think at lower flow you could exit and portage the second move. I think you could then potentially finish the portage on that side at river level. Or put back in and run the exit which I think would be on the left down to medium low flow… but there were rocks in there so I bet too low and it closes out. But I bet that low the portage options open up more at river level. So yea, because of that I think that until the river goes into relicense (2022) I just can’t see this being too popular. Apparently back in the 70s and 80s it was run regularly before Kerchoff #2 was built and the flow was predictable. 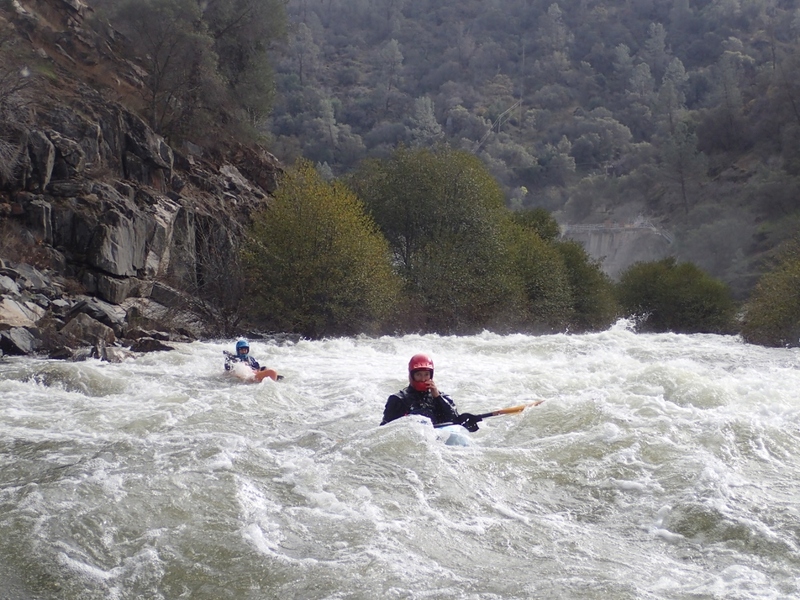 Maybe in a few decades that sort of arrangement will come back (ahem… American Whitewater). 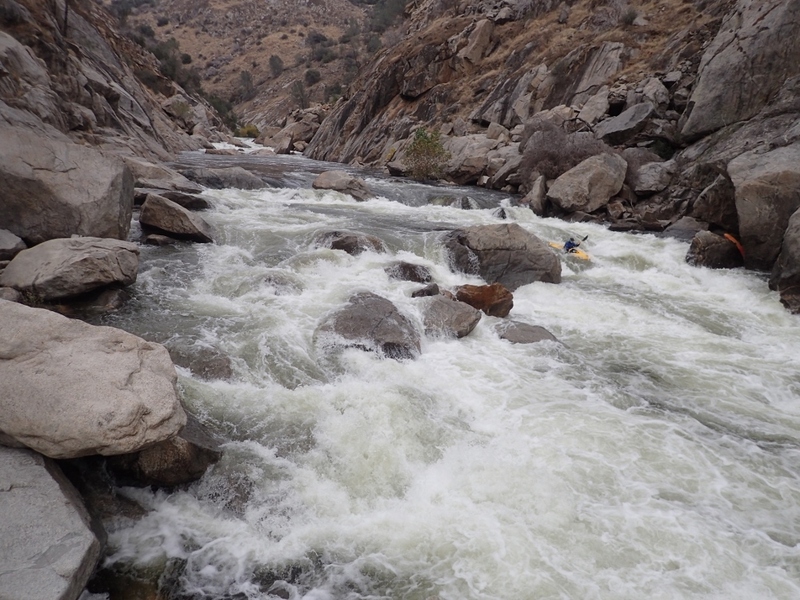 I thought the 2,000 cfs was a great flow for the rapids… I think a little lower would make it a little easier… but too much lower would make it junky in the rapids. 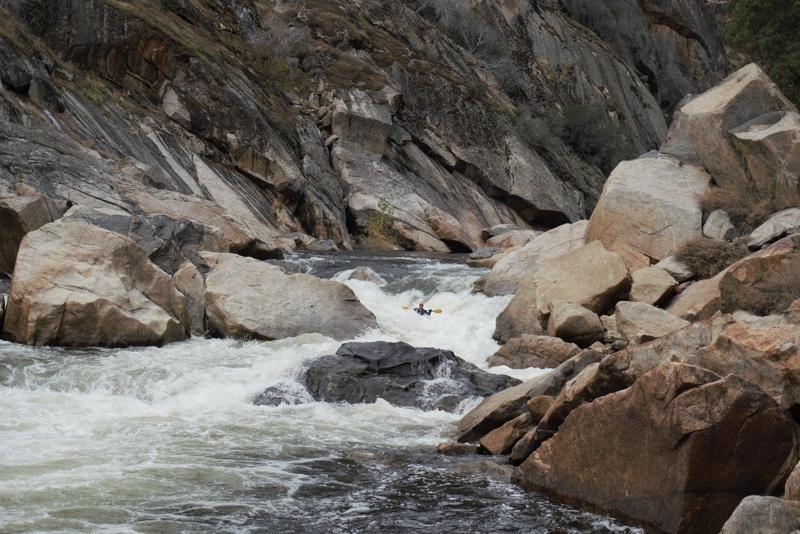 Look at the google maps… the rapids are just boulder piles with a lot of water going underground. So maybe 1,700 cfs would be a sweet spot for ease. 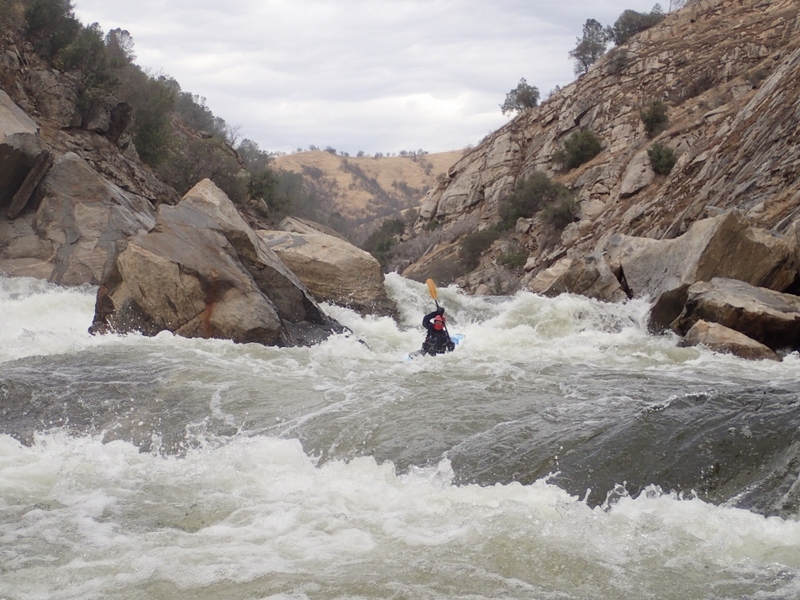 As it was though at 2,000 cfs everything was boofable or avoidable, it was just fluffy for sure. Lake (F). 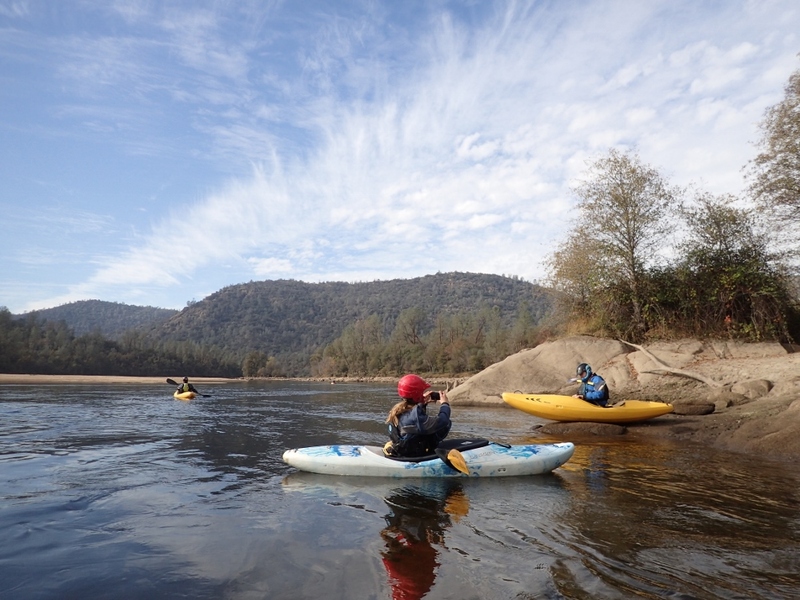 The run starts with a warm-up of flat water. At least for us due to the low lake level we had moving current for half of it! 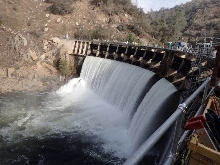 Dam (P). Get out on the left at the dock, walk around the structure, climb the stairs, then descend other super slick stairs and walkways down to the river below. Boogie (III). 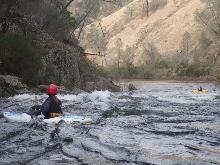 Some fun boogie, avoid the big holes (depending on the flow)! Island (II). A wall of trees… it looks horrible but as you work your way further down stream you find an opening that has a nice clear channel through the trees. It is like 20 feet wide. Blind Rapid (III to IV-). 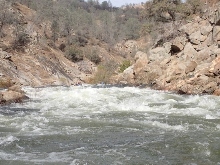 After a pool there are more trees and you enter a rapid that you can tell has more substance to it. 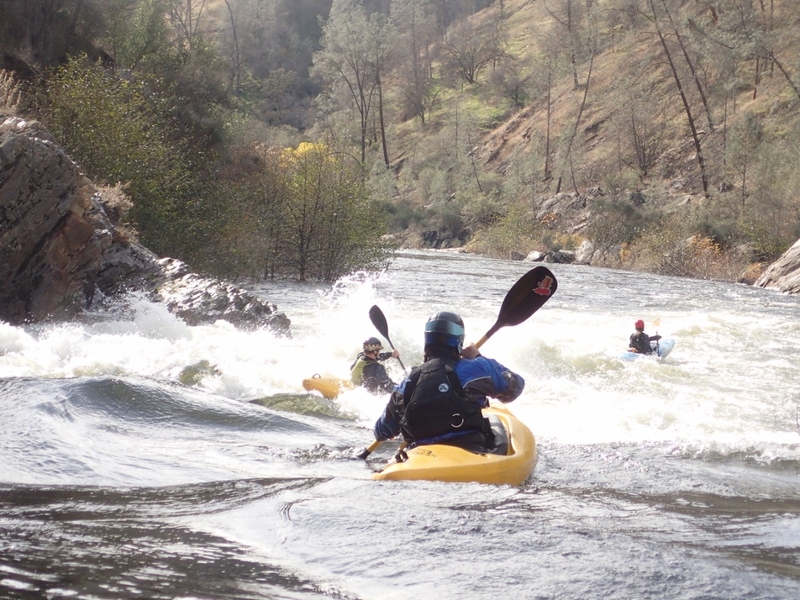 The rapid starts class II and moves you down the left as the rapid bends right. This then leads to a sizable hole blocking the left two thirds of the river. Down the middle of it was meaty, for better results stay far left. One in our group surfed it but fairly easily got out on the far right. Boogie (III). 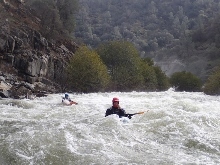 A few fun boogie rapids in here ranging from II+ to III. Class IVs #1 (IV). 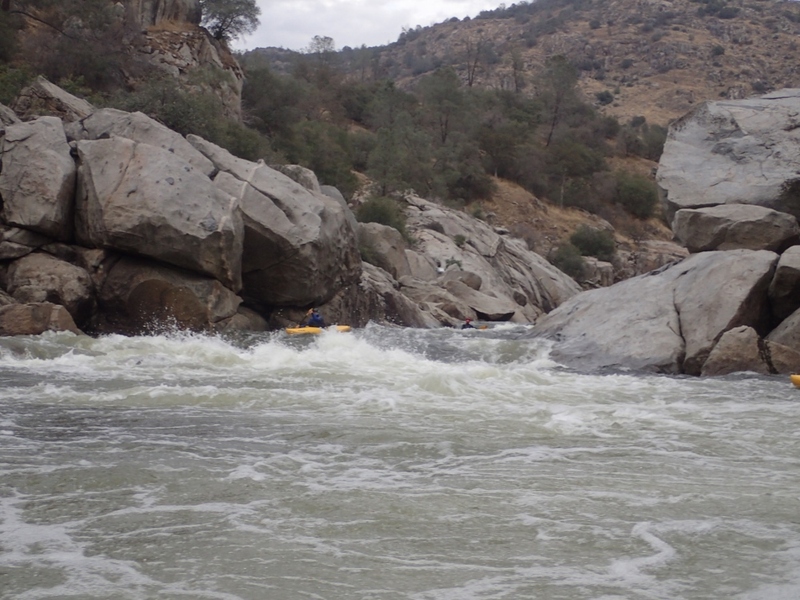 At our flow we had a few class IV rapids in this section of the paddle in. They started mainly once the river bent to the south. 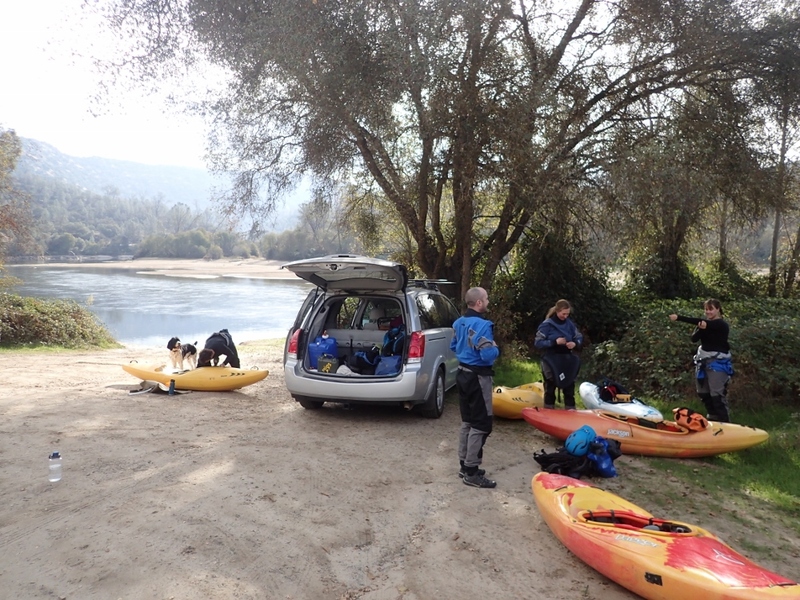 We boat scouted all of them and they all had holes. One was a thread of the needle around two holes moving left to right. Class IVs #2 (IV). Another was a ramp down left of center before working back to the right at the bottom. Boogie (III). A little more boogie until the river turns south. First Five (IV). 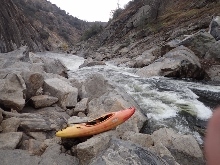 Apparently at lower flows you want to portage this as it gets junky. But for us we didn’t even boat scout… there was a line down the right of center. It was obvious as you approached as there was the first of the house sized boulders on the left shore and a lot of water going left from the left channel and under it. Just don’t go down that channel! El Limbo (V). Darin scouted from the center rock sieves, I scouted from the right shore. The center definitely offered a better view. We drove far left across the top and boofed the top hole far left. Do not be right as a lot of the outflow of the hole goes into sieves on the right. Below, the river splits around a rock, right is ideal… which leads to a hole that you can punch left or right. A few of us had to surf out without too much effort. Boof (III). 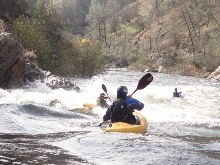 The next rapid had a sweet boof on the far right or was a simple tongue down the left. Split (IV). 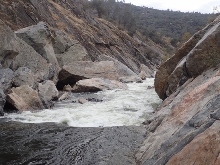 The next rapid the river split around a midstream rock, I scouted as from above it looks bad. It ended up being pretty mellow just a ramp that corkscrewed bouncing off the walls… pretty straight forward to just go down the center of the left channel though. Boogie (III). 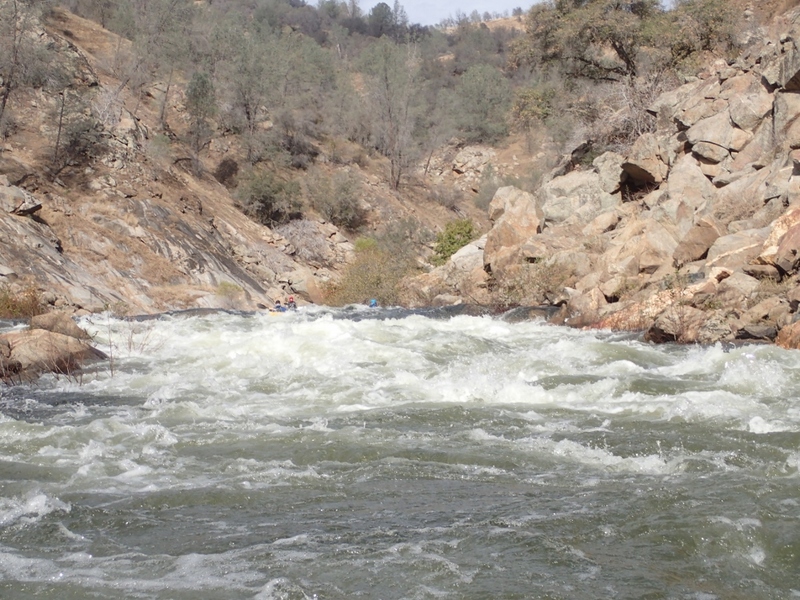 One or two boogie rapids in here before you get to the obvious large rapid and horizon line. Scout from the left sooner rather than later. There are last minute eddies but they are hard to egress from. Post Binocular #1 (IV). This one wasn’t that hard, we entered left of center and drove right. Be aware, if you enter far left it leads to a sieve… where Jeff’s boat ended up. Post Binocular #2 (IV). 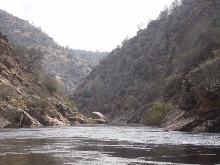 We started left and drove far right across the middle of the rapid. This move was to avoid holes top right and bottom left in the rapid. Take-out: Find your way to the town of Auberry 40 or so minutes north east from Fresno. Once in town, take Powerhouse Rd towards New Auberry. After 1.8 miles, turn left on Smalley Rd. Follow this for 5.3 miles down to the new powerhouse where the road ends. This is the Squaw Leap take-out. For the partial run (if Squaw Leap is too high), head back up Smalley Rd for 1.0 miles. Just past the campground turn left at the first junction you have come to since leaving the new powerhouse. There is a parking area 100 feet later on your right. Park here and then hike further down the road another 300 ft and turn left at a gated road. A short ways later there is a fork, take the left fork down to the old powerhouse. Scramble down the last 50 feet to the river. The total hike is 0.6 miles. 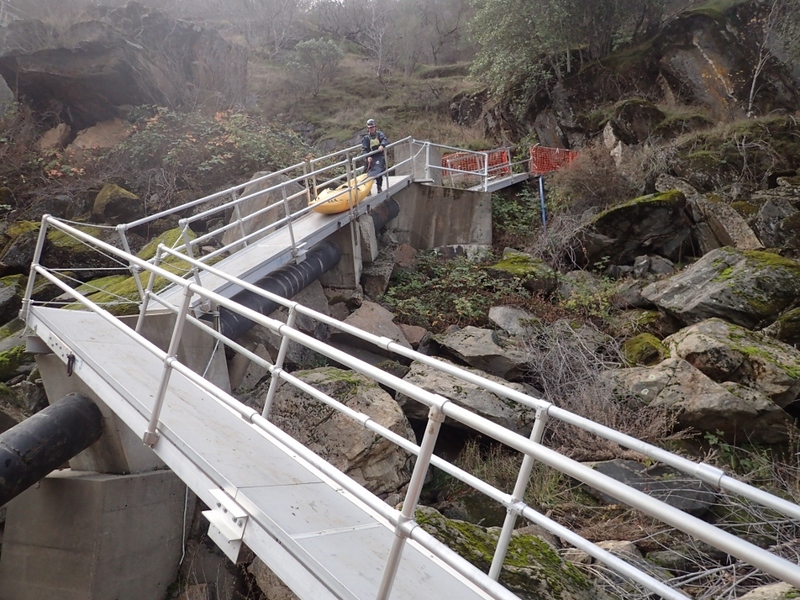 Put-in: Take Smalley Rd 5.3 miles back up to Powerhouse Rd. 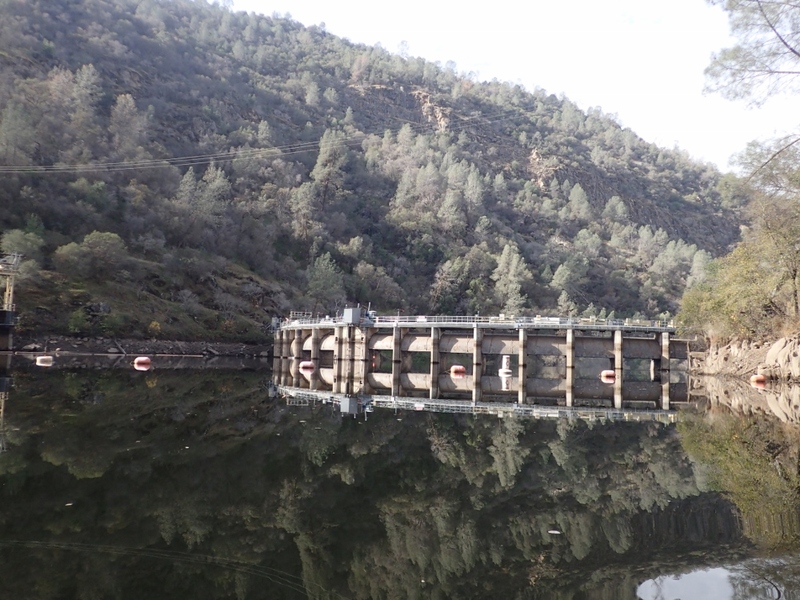 Turn left on Powerhouse Rd and follow it for 5.6 miles to the bridge over the river at the top of Kerckhoff Lake. Continue a little over a quarter mile to one of the access points along the lake before the road pulls away.